Ellen Ehk (Personal show 2018). What interests the artist are double-walled vessels in which the strongly differing exterior and interior shapes form a deliberate contrast. This is also frequently echoed in a contrast of colour. 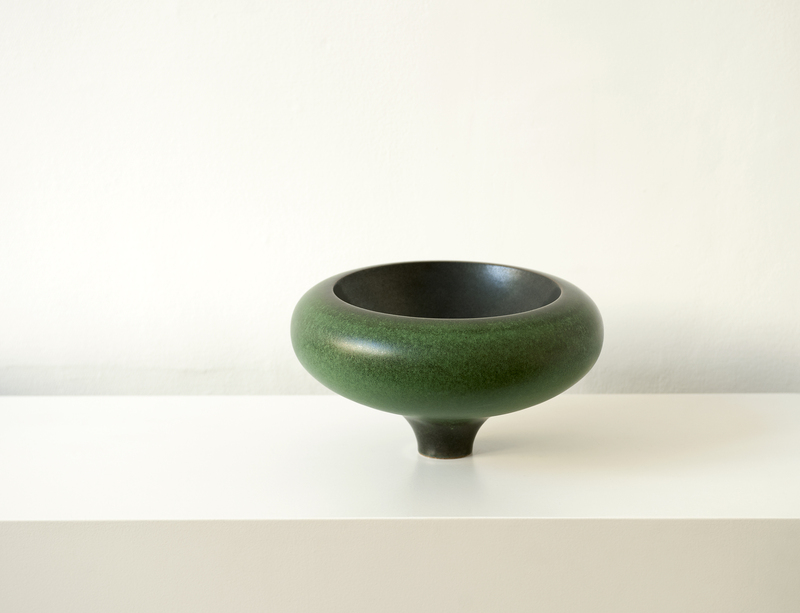 The construction of the form is often conceived in such a way that the glaze runs down the vertical wall forming glaze droplets on the lower edge. Fired in an open reduction flame, the oxblood and celadon glazes reveal their true beauty. 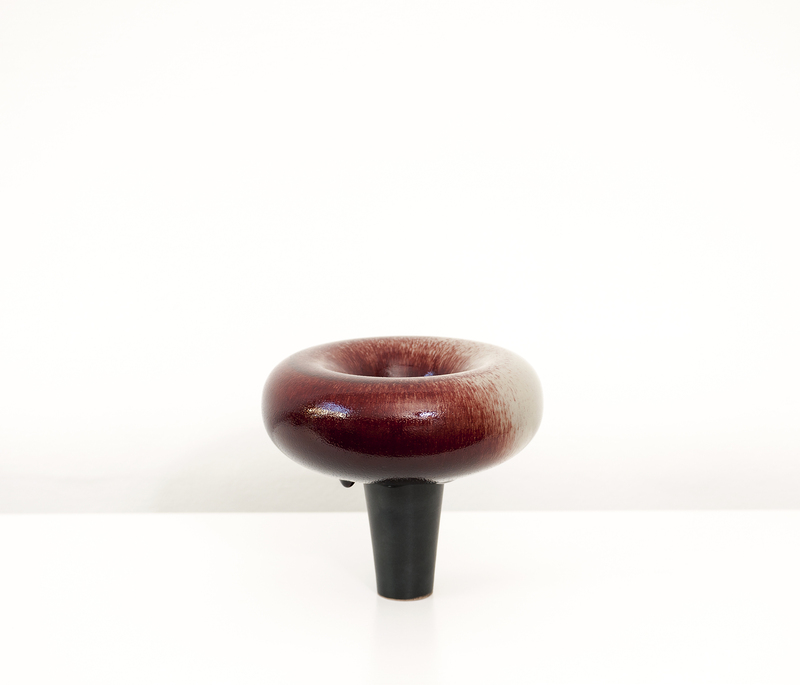 The various shaped elements, such as feet, body and interior form, are accentuated and distinguished from each other by different glaze treatments – matt or gloss – and colours. In doing so, the light-coloured body of the sharp edges stands out visibly. The overall image, which is never neglected, appears to be the result of a clear sense of form and design as well as precision craftsmanship. He often uses a scalpel to shape the sharply worked edges of the inwardly descending form. The silhouette shows the dynamic sequence of the curve and the counter-curve, as well as concave and convex form elements. The outer surface is often glazed matt black, only to flow downwards the inside in iridescent blood red, like a fine pelt. The closed receptacles often show the reverse of this effect: gloss glazed on the outside, the small interior form appears silky matt black. In addition to a Yellow/greenish-brown/almond tree ash glaze, Thomas Bohle has developed a palette of glazes which allows many form-related combinations. He focuses on the relationship between form and colour. This results in an exiting dialogue between the forms, with their matched proportions, and the stunning glazes, which break up the strict geometrical lines. To achieve the highest possible amount of inner power requires the constant expansion of technical limits. During the reduction firing in a gas kiln at a temperature of 1280°C and when applying the various glazes to the same object, new obstacles have to be overcome constantly. 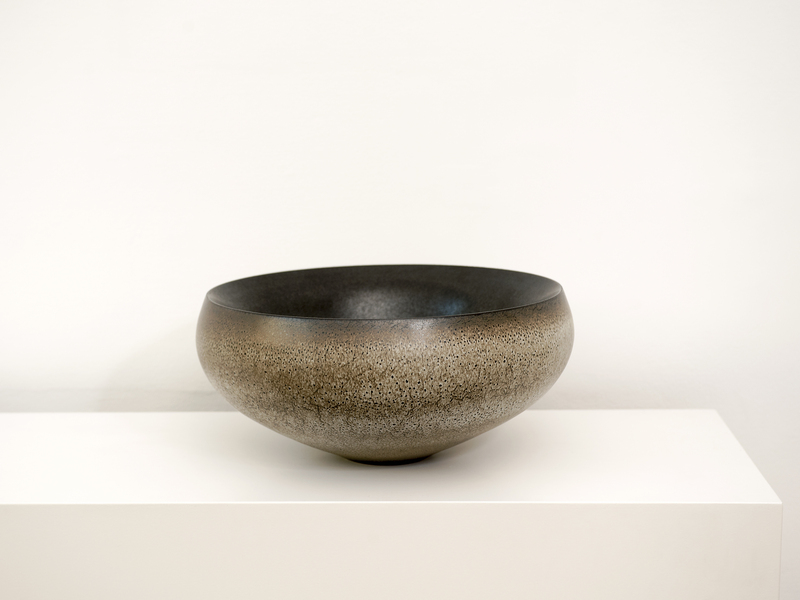 Mastery of stoneware clay, familiarity with the laws of glazing and knowledge of the independent power of fire are a distinguishing feature of Thomas Bohle’s work. As a representative of a strict world of vessels, he succeeds in distilling something distinctly his own from the impulses he receives. He does not work erratically; he has a systematic approach and an eye for individual shapes and forms. Driven by the desire to intensify what he has already achieved, each new piece is an extension of its predecessor. Parallel to this, the technical perfection he displays is not merely something static that can be taken for granted, but much more an extension of formal possibilities. Always conscious of the fact that only a certain willingness to take risks can give the object the kind of intensity that fascinates and impresses, Thomas Bohle also has to accept failure. Happy Christmas Stocking 2010, Thomas Bohle (Personal show 2007).